Η Galeon μόλις έχει αποκαλύψει το νέο της εγχείρημα το 445 HTS ένα πολύ ελκυστικό και κομψά σχεδιασμένο yacht με σπορ εμφάνιση και δυναμικό χαρακτήρα συνδυαζόμενο με μια πολυτελή και άνετη διαμόρφωση. Οι ευκολίες φιλοξενίας περιλαμβάνουν δύο καμπίνες με αντίστοιχα ανεξάρτητα μπάνια, διπλά σαλόνια, μια κουζίνα και δύο μεγάλες επιφάνειες ηλιοθεραπείας στην πλώρη και στην πρύμνη όπου κάτω από την τελευταία βρίσκεται το γκαράζ για το jet ski. Φαρδιά παράθυρα και φωταγωγοί επιτρέπουν άφθονο φυσικό φως να εισέλθει στο εσωτερικό. Το σκάφος θα έλθει στην αγορά σε τρεις μήνες. Ακολουθεί δελτίο τύπου (Αγγλικά). Galeon has just unveiled its latest project the 445 HTS a very attractive and elegantly designed yacht with sportive look and dynamic character coupled with a luxurious and comfortable layout. The accommodation facilities include, two cabins accompanied with two separate bathrooms, double lounges, a galley and two large laying areas in the bow and stern where a jet ski garage lies underneath the latter one. Wide windows and skylights assure that abundant light penetrates the interior. The boat will come in the market in three months. Press release follows. 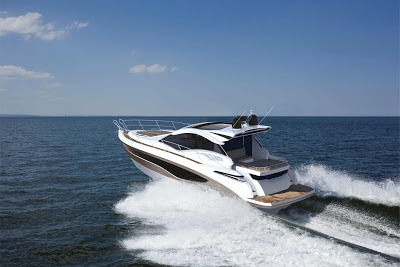 The 445 Hts joins the Galeon's third-generation model lineup with its brilliant, eye-catching design. This open-deck sport model, offers dynamic performance and a thrilling ride while maintaining an exceptional level of comfort. The layout of the 445 Hts was conceived to offer a convenient and specious living arrangement. 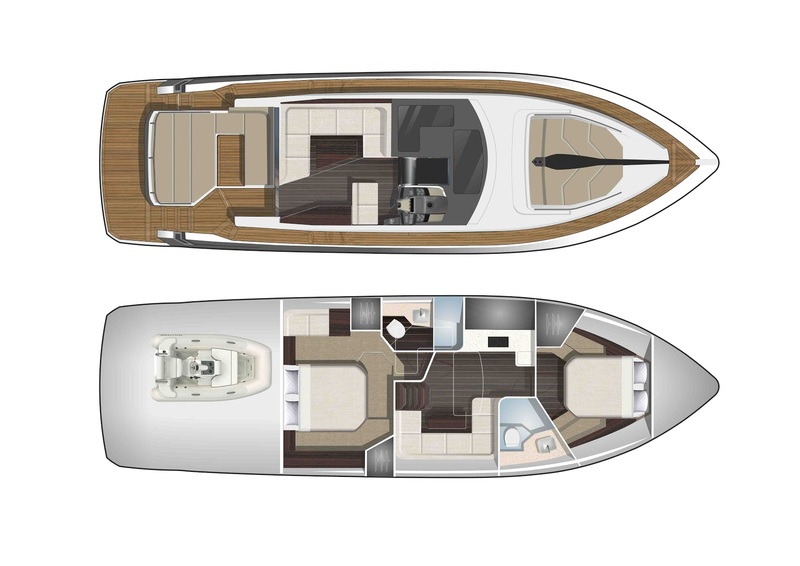 The top deck features a U- shaped sofa, wet bar and a helm station with double seats. The cockpit area is separated by drop-down windows and mostly occupied by the large sundeck on top of the garage. Wide sidedecks on both sides lead to the bow where an additional leisure area awaits. Below deck the master cabin boasting an en suite bathroom is located midship while the double guest cabin holds the bow area. An additional bathroom, galley and a lounge area connect the bedrooms and are available for all the guests to enjoy. An abundance of natural light penetrates the interior through the large, glass ceiling over the helm station and the doors dividing the cockpit. Down below cabins are well lit thanks to the hull-length windows and ample skylights in the bow area. 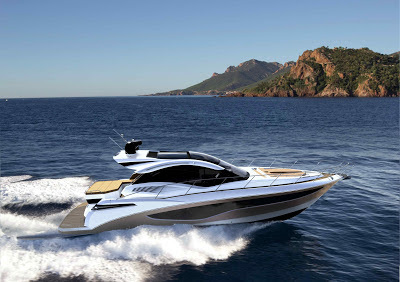 The yacht boasts plenty of technical gadgets and improvements including the spacious hydraulic garage and platform for personal watercrafts like Jet Skis and RIBs or the retractable, automatic glass doors in the cockpit. Passengers will surely enjoy the hand-operated bow bimini and the electric marquee extending the roof for extra protection from the elements. A wide range of engines with IPS or sterndrive propulsion systems is available along with a comprehensive list of additional equipment including several design lines.